Enjoy a fast turnaround time with Multicolor Labels for custom numbered stickers, sequential numbering on labels, and random numbered labels. We can complete these with full line barcodes and other serialization options for better production identification. Whether you need serial numbered stickers for nameplates with alphanumeric sequential numbering, or linear barcodes for product and warranty identification, or two-dimensional (2D) barcodes to show a broader range of data, we have all your needs covered. Our number labels can be created from a variety of material selection. Typical choices include reflective vinyl, clear vinyl and high bond labels. Multicolor Labels offers sequential number ranges with prefixes and suffixes according to your specs. Label prefixes can be used to reference departments, subsidiaries, or enterprise divisions. For example, we can encode asserts purchased during a specific year using letter prefixes or suffixes (i.e. VES-01001 or 01001-VES) that use additional, unchanging elements within that numerical sequence. Standalone sequential numbering, as seen on barcode stickers and asset tags, typically use numerical sequences beginning with zero or one. For example, an asset numbering sequence beginning with 01001 would progress to 01002, then 01003, and so on. Standalone sequential numbers allow for the unique identification of fixed assets. Serial number labels are commonly used to mark asset tags IDs, property ID Labels, and tamperproof warranty or security labels. These serial numbers take the form of standalone labels, or are incorporated into rating or barcode labels. Our digital printing allows low minimum short run jobs that can be easily customized to suit your equipment and inventory tracking needs, regardless of the industry. Consecutive number labels have plenty of uses, especially for tracking, organization, and logistic purposes. Use-case scenarios include apartment complexes and universities that need to issue parking permits, which require consecutive number labels. Other uses for these labels include inventory control at offices, truck fleet tracking, library book tracking, and warranty plus inventory labels for manufactured products. Consecutive labels come in many varieties. They can take the form of plain numbers for human eye readability, or complicated barcodes for laser scanners to decode — or a combination of both. Color codes and spot colors for asset tags can be added if required. Its advisable to break up long numbers with dashes for easy readability. Try not to run a string of more than three identical numbers in a row. For example, 98757898797 is difficult to interpret due to repetitions of the same digit. Having “zero” and “O” together or the letters “l” and “1” in serial codes is asking for trouble! Example: 0O1l59. Having your serial number labels over too large is also a trouble. Any customer contacting your support team may get frustrated if it is hard to read or understand the serial number on your labels. Simplifying by creating a readable serial number label is simple, costs little, and prevents confusion! At Multicolor Labels, we digital print variable data labels, barcode label stickers, and QR code labels. 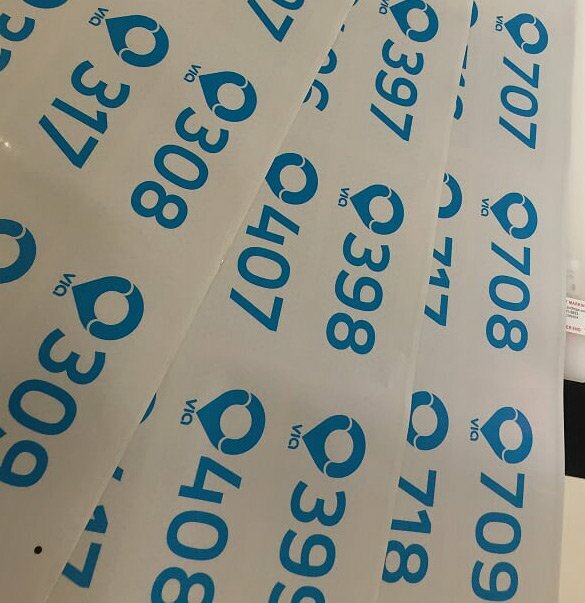 We’re here to help you increase the capabilities of your asset identification, tracking and protection with high quality, full-color custom made numbered stickers. Contact us for more information on our custom quotes and low minimum short runs.